Today was about learning and finding the joy of the moment. When you are making any kind of change in your life, I think it is important to understand the whys and wherefores. For me, this helps me to plan the way forward knowing that I have the knowledge and back up to cope. This can be anything from a technical skill to having people in my life who can give me solid advice. But it also means finding inspiration whether from literature, places or people. 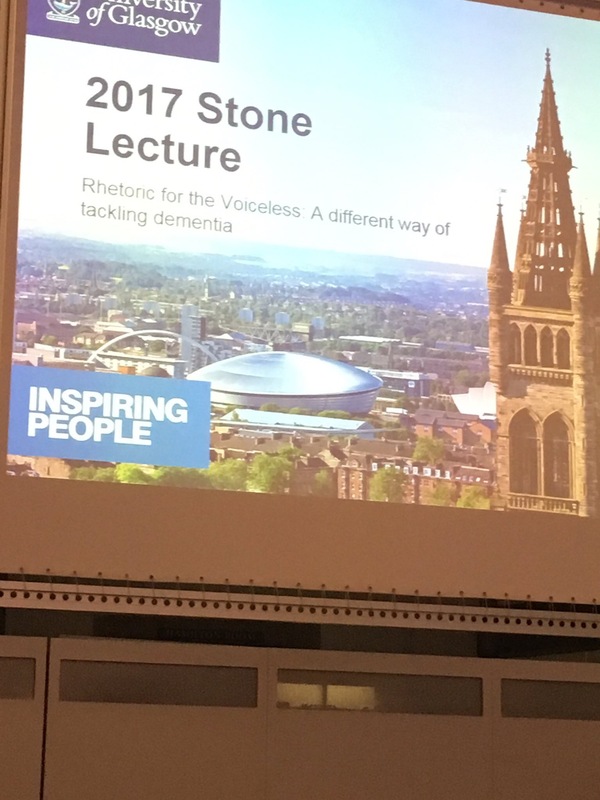 I was privileged to attend the 2017 Stone Lecture at Glasgow University tonight. It was given by Sally Magnusson the writer and broadcaster, and more recently the founder of Playlist for Life. This is an amazing charity who do fantastic work with those who have dementia and their families. They use music as therapy to help communication and as a way for families to help cope with the difficult times. The key messsge for me was when Sally described the importance of finding “the joy of the moment”. So often with dementia it is the small glimpses that keep families in touch with their loved one, and I guess it is the same for all of us. When times get tough, think of that small piece of joy and focus on the feeling it gave. It really helps when you need to cope with the challenge that change brings.